The city of Ft. Lauderdale, located in the southeastern tip of the Florida peninsula, is a relatively new city, not having been developed and incorporated until the early 1900's. Previous to that time, the area was referred to as the "New River Settlement," and served as a stockade in the Second Seminole War. After the area was abandoned in 1842, it saw little prosperity until the Florida East Coast Railroad completed a route there in 1896. 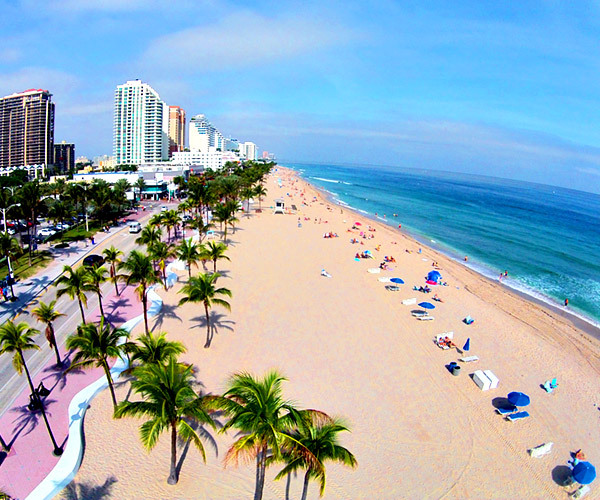 Today Ft. Lauderdale is home to over 180,000 people within its city limits, and over 5 million in its metropolitan area. Due to its 7 miles of beaches, the city is a major vacation spot, having attracted over 10 million visitors in 2006. One of the unique features of Ft. Lauderdale is its 165 miles of waterway and canals, which has earned the city the reputation as the "Venice of America." The city is also known for its high concentration of yacht owners and boating enthusiasts--the population of Ft. Lauderdale has more yachts per person than any other place in the world.